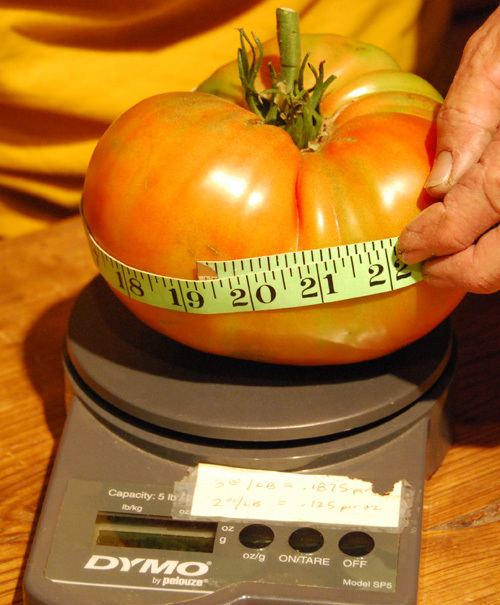 This tomato is from a Big Zac variety and is 19.25 inches in circumference and 2 lbs, 14.4 oz in weight. It is still turning red but has completed it’s growth. I didn’t see anything bigger down at the fair. We will see.. 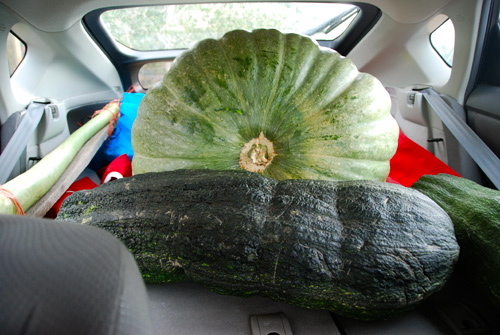 This giant ‘greenie’ squash is ‘The Hulk’ and estimated weight is 157 lbs and has put on 7 lbs a day in the last 5 days. Here it is in the back of the Prius. It barely fit in! I still have 2 bigger greenies growing in the garden for the big weigh-off. 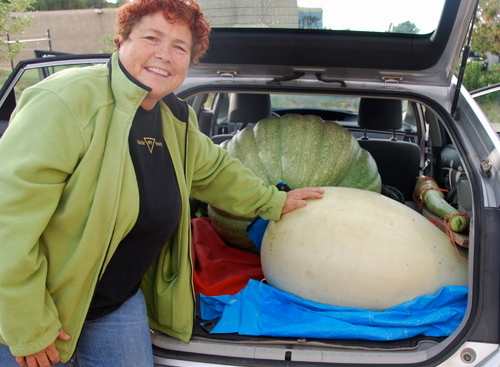 Here is the giant Long Gourd, ‘Digi’, which is measured by length-it is 59.5 inches long-basically the length of the back of the Prius with the seats down. It had stopped growing. I still have some longer ones still on the vine that I’m saving for the big contest. In the foreground is the whitish pear gourd. 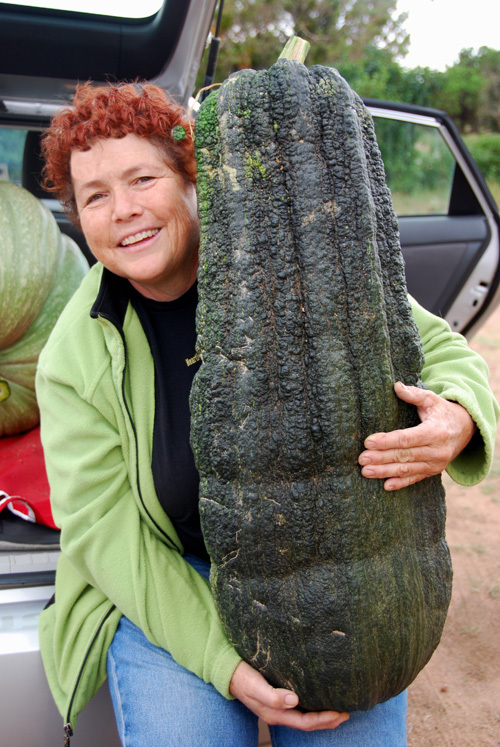 Here is the third biggest giant marrow (zucchini), ‘Little Boy’, which is 47 inches long and 27 inches wide! 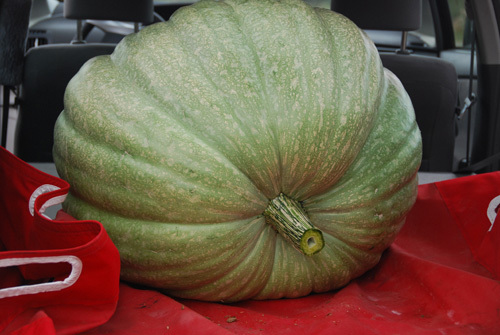 It ended up weighing 43.5 lbs which was bigger than the one I took last year to the fair.That one was 34 lbs. 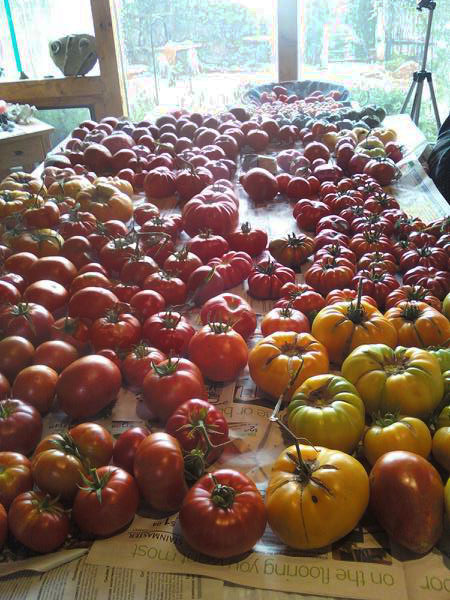 I have bigger ones in the garden yet to come for the big contest. 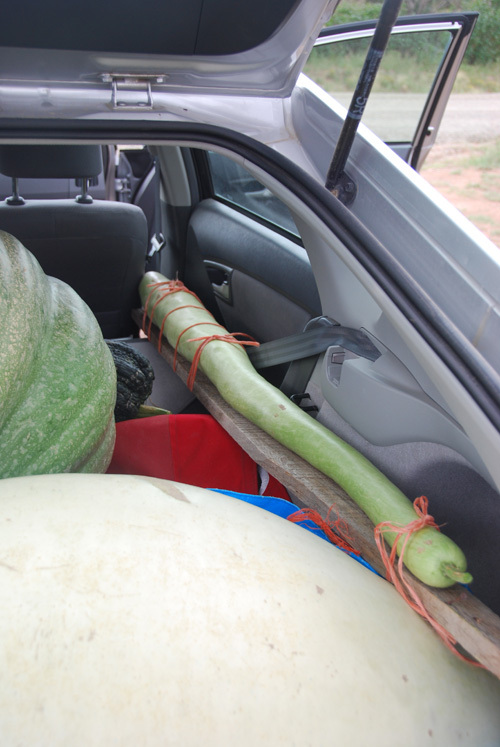 This entry was posted in general, giant green squash (greenies), Giant Long Gourd, Giant Pear Gourd, GIANT PUMPKINS, GIANT TOMATOES, GIANT VEGGIES-OTHER, GOURDS, marrows and tagged giant green squash, giant long gourd, giant pear gourd, giant tomato, giant vegetables, NM State Fair. 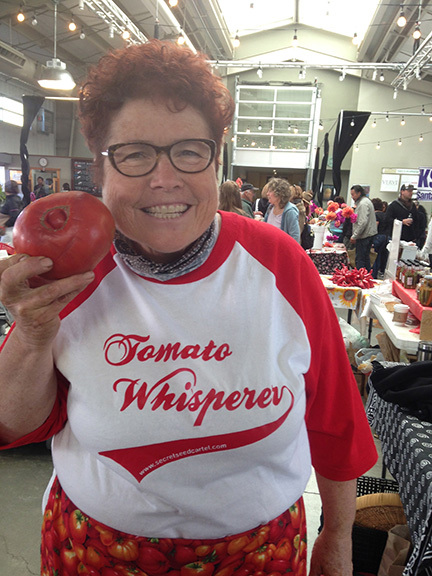 Good luck at the State Fair….. hope you bring home lots of blue ribbons… your veggies look awesome! Wow those are huge! LOL I thought I had a very large cucumber. It was an Armenian and was 42 inches long and weighed 14 lbs. I may have to enter next year at the fair. That is huge for a cucumber! you should enter one in next year if you get it that large. Congrats on your giant! Awww! Thanks. Actually we got about four of them that big. Some were stuck in the fence though and just continued to grow. LOL I did put pictures of all the cucumbers on my site. Hey I just went to your blog and emailed you. Let’s keep in contact. Just sent one back! I definitely want to stay in contact. Thank you for your kindness.